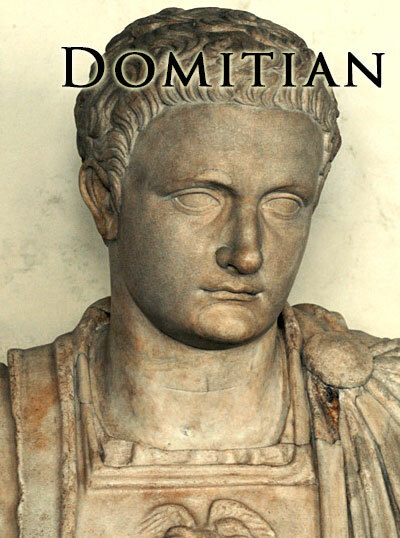 Domitian was the brother of Titus and the youngest son of Vespasian, he was the third of the Flavian line of emperors. He resented his father's favoritism toward his brother Titus, who was 12 years older than he. Even though he had much less training by his father, the first few years he managed public affairs and maintain popularity. He was an active builder, maintained strict order, and was determined to follow in the footsteps of Augustus. Yet the historian Suetonius noted that there was a lack of money, and this made him greedy and cruel. He demanded absolute authority, and considered himself divine, he was to be addressed as dominus et deus "lord and god." The Senate opposed him and in 88 A.D. the commanders of four legions in Germany revolted against him, yet when Domitian learned of this he had them executed or exiled. Several years later he severely persecuted the sect of the "Christians" and had the apostle John banished to the Island of Patmos. In 92 A.D. two of Domitian's legions were crushed by the Dacians (near modern Romania) and this led to many plots again Domitian's life. He was finally murdered in 96 A.D. and it is recorded that the assassins were his wife, his attendant, and the commanders of the Praetorian Guard who stabbed him to death in his bed-chamber. 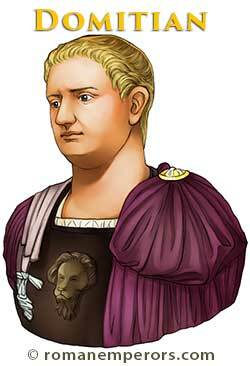 Domitian was the last of the twelve Caesars.